This one isn't going to send a red Tesla and Starman towards Mars. It has a more mundane (and profitable) mission of launching a heavy communications satellite for the Middle East up to geosynchronous orbit. Here's a little video showing the thing being assembled at Cape Canaveral. The launch window appears to open at 6:00 PM EDT (22:00 UTC, 3:00 PM PDT) on Tuesday April 9. It will probably be livestreamed multiple places, including most notably SoaceX which should have the onboard video feeds. They will once again be trying land all three of the boosters, two simultaneously at Cape Canaveral and one at sea. Here's a thing from Google Maps, that shows the target area for the center core out in the Atlantic (the yellow box) where there will be aircraft flight restrictions and where the Space X landing barge will be (the blue pointer inside the yellow box). The two side boosters will return for a spectacular synchronized landing at Cape Canaveral. Lots of people are planning to be in Florida to watch this. SpaceX photo of the Falcon Heavy in its hanger after its static test fire, being mated with its payload in preparation for its launch Tuesday night. Note the old soot-stained Falcon 9 booster by the right wall. Talk is that this is core B 1048, which has already flown three times in July and October 2018, and February 2019 (when it launched that Israeli lunar lander). Elon has confirmed that 1048 will be used for the Crew Dragon in-flight abort test coming in a month or so, so its fourth flight will be its last. The booster will simulate a booster accident in flight, will probably break up and won't be recovered. Its landing legs already appear to have been removed. The scoop on all of the SpaceX Falcon 9 cores is in the link below. SpaceX's own identification system numbers them, starting with 'B' for 'booster' and '1' for first stage. Then three more numbers that began sequentially with 001 (hence B 1001, which was a prototype for testing at McGregor but never lofted a satellite). The latest is B1057 which is an as-yet unflown Falcon Heavy center core slated for the third Falcon Heavy flight in June, booked to loft a US Air Force payload. 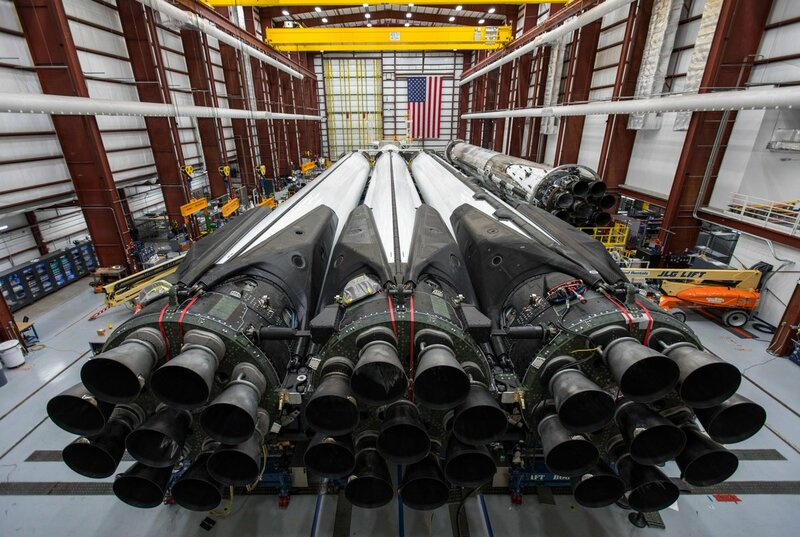 The Falcon Heavy to fly this week in the photo below consists of B 1052 and B 1053 (the side boosters) and B 1055 (the center core). (Apr 8, 2019 02:55 AM)Yazata Wrote: . . . Note the old soot-stained Falcon 9 booster by the right wall. Talk is that this is core B 1048, which has already flown three times in July and October 2018, and February 2019 (when it launched that Israeli lunar lander). Elon has confirmed that 1048 will be used for the Crew Dragon in-flight abort test coming in a month or so, so its fourth flight will be its last. The booster will simulate a booster accident in flight, will probably break up and won't be recovered. Its landing legs already appear to have been removed. With that kind of preordained doom, makes one wonder if they'll even bother to clean it up and refurbish it appearance-wise. Latest from SpaceX is that the upcoming Falcon Heavy launch has slipped from Tuesday night to Wednesday night, because of weather. There's a chance of thunderstorms on Tuesday that apparently have a 70% chance of lingering into the launch window. But Wednesday night has an 80% chance of being satisfactory. (Apr 8, 2019 06:09 AM)C C Wrote: With that kind of preordained doom, makes one wonder if they'll even bother to clean it up and refurbish it appearance-wise. I doubt if they will clean it up or repaint it. It will probably look like that when it launches on its suicide mission. No,no,no! I was wrong! The sooty booster next to the Falcon Heavy isn't poor sad doomed B1048. SpaceX tells us that it's actually the booster that launched the recent Crew Dragon DM-1 Demonstration Mission that delivered Little Earth to the Space Station. That suggests that it would be B1051. B1051 is apparently scheduled to launch three Radarsat satellites on May 16th. B1050 was originally scheduled to do it, but its control system hydraulics got stuck attemping to land a previous flight and it started spinning uncontrollably, crashing into the ocean. It's in a hanger at Cape Canaveral but is apparently a write-off. So B1051 seems to have gotten the job. The Radarsats are a 'constellation' of three Canadian Earth-observation satellites operated by the Canadian Space Agency. They can detect shipping, ice in northern Canadian waters and stuff like that. The Canadian military use Radarsat data in a project that they call Polar Epsilon, to maintain surveillance of the remote Canadian north which is so big and so remote that anybody could be doing anything up there without Ottawa knowing. (Apr 9, 2019 05:11 AM)Yazata Wrote: No,no,no! I was wrong! The sooty booster next to the Falcon Heavy isn't poor sad doomed B1048. [...] That suggests that it would be B1051. B1051 is apparently scheduled to launch three Radarsat satellites on May 16th. No doubt as to what national anthem that lucky booster is singing, to irritate dispirited #B1048. There should be another good livestream at the address below. Probably best before the launch, because it starts before SpaceX's feed and features some of the NSF engineering geeks answering questions off twitter. Good information this afternoon about FH payload to various orbits and stuff. Worth checking out. During the flight, the SpaceX feed (link in the previous post) will probably be best since they have better close-ups, on-board video from the rocket, and video from the center core's landing out in the Atlantic. (Apr 11, 2019 12:46 AM)Yazata Wrote: They just scrubbed today's Falcon Heavy launch due to high upper-atmosphere winds. The forecast says that it should be better tomorrow. Yeah, Wednesday was supposed to be meteorological bliss. Counties like Brevard, Volusia, Orange, Osceola, Seminole and Indian River are surely getting tired of receiving triple sonic boom alerts everyday.